Holy Moly! With over 25+ ingredients and a gazillion steps, Bún Bò Huế is easily one of the most complex recipes I’ve ever made to date. After buying all the ingredients, I had trouble sleeping the night before I kept thinking about all the new ingredients I will be cooking with and how it would turn out. I woke up every hour until I finally slipped out of bed at 6am and started cooking. From beginning to end, it took me almost 6 hours to complete. The first bowl was not until 12pm! 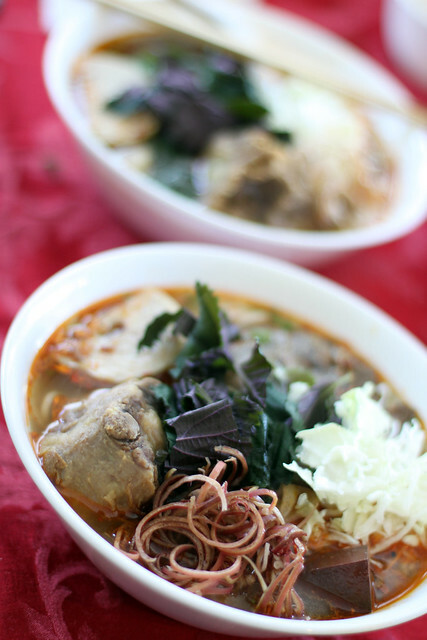 I was super satisfied with the beef-y, lemongrass-y broth and my house smelled like Bún Bò Huế An Nam Restaurant, my favorite place for Bún Bò Huế. 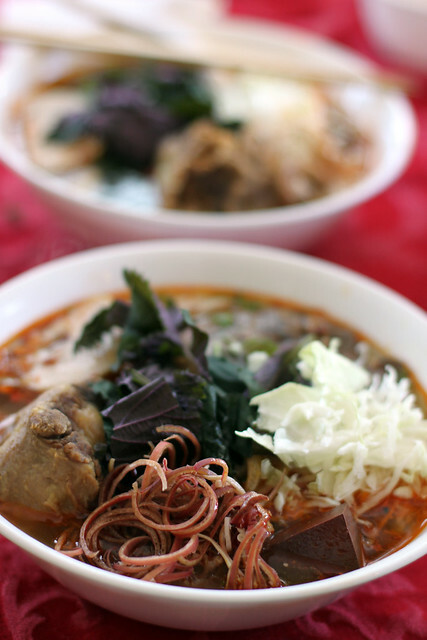 I think I mentioned this in previous blogs, but Noodle soups are awesome because after preparing the broth, meats, and garnishes, each person can customize their bowl with the endless options available based on personal preference. 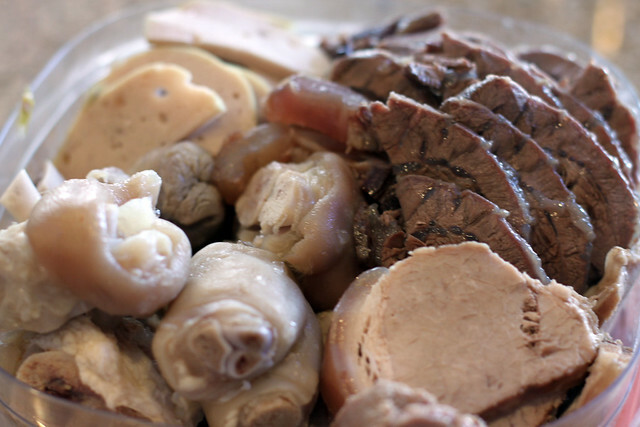 Picky eaters can simply pick from safe choices like beef and steamed pork while the more unadventurous eaters can include delicious pork blood and pork feet to their bowl. This version is also very kid-friendly as I prepared the Sate chili oil separately and did not add it directly in the broth. Even non-spicy eaters like my daughter and niece were able to enjoy the wonderful lemongrass-y beef broth without their faces turning bright red. Everyone is a winner! Add shrimp paste to a bowl and add hot water. Stir and dissolve for 2 hours. Strain shrimp paste liquid and set aside. Marinate beef shin and pork leg in 3/4 cups of fish sauce for an hour. Heat wok on stove top to medium high. Add 2 tablespoons oil and cook onions until soft and translucent. Add black pepper and garlic with about 1 minute cooking time left. 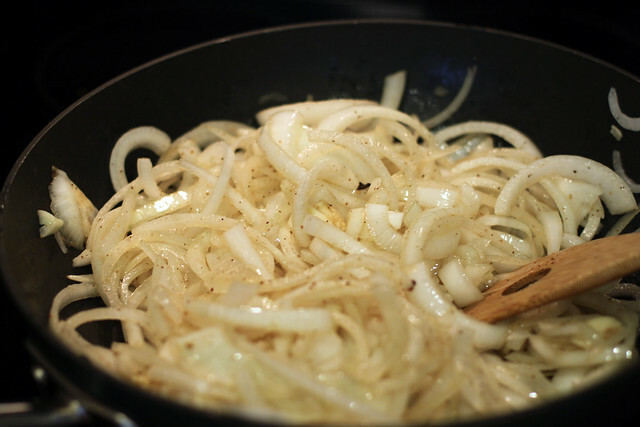 Wrap stir-fried onions, cinnamon, and cloves in a cheese cloth and set aside. Add 12 quarts of water to a large stockpot. Add remaining fish sauce, salt, and oxtail and bring to a boil. Bring to a simmer and constantly skim impurities from the surface of broth and discard. Add beef shin, pork leg, lemongrass, scallions, and cheesecloth bag to stockpot and bring to a boil. Lower heat to simmer and continue cooking for 1 1/2 hours and skim impurities regularly. Remove meat from broth and set aside. Add shrimp paste liquid and sugar to broth and continue simmering for 1 hour. Add annatto sead oil at the end for color. Cook thick vermicelli noodles according to package instructions. Wash vegetables accompaniments and thinly slice banana blossom. When meat is cooled, slice beef shin, pork leg, and cha lua into 1/8 inch slices Prepare pork blood and pigs feat. Put all cooked meat on a large plate or tupperware. To make the Bun Bo Hue Sate, heat saucepan on stove top over medium heat. Pour in vegetable oil and fry garlic for about a minute until fragrant. Add lemongrass and chli flakes to the oil and fry for another 2 minutes. Turn off the heat and add chili oil and shrimp paste (if desired) and mix until combined. 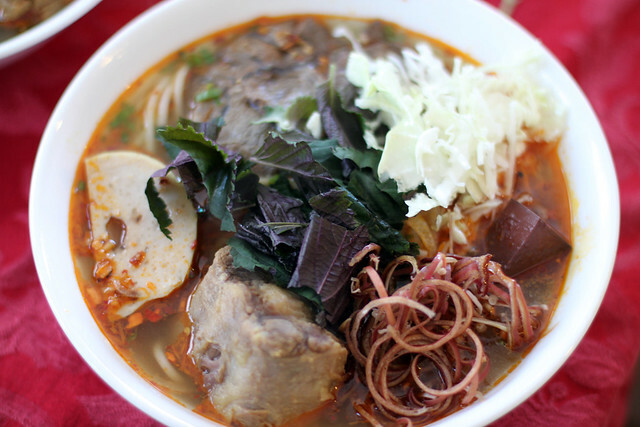 To prepare Bun Bo Hue bowl, place noodles in a bowl. Top bowl with assortment of meats, 2 teaspoon of Sate and top with boiling broth. 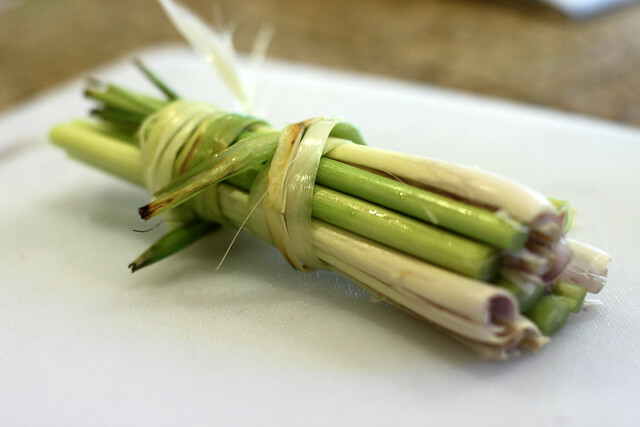 Garnish each bowl with some onions, scallions and serve with lemon wedges, Perilla leaves, and beansprouts.